Sometimes we have to see it to believe it, but vision boards really do WORK! 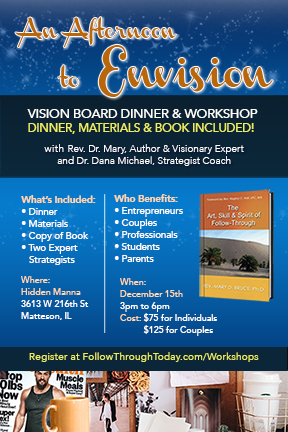 This isn’t just another vision board workshop, it is a Follow-Through experience, complete with an amazing dinner with people just like you. First ten to register also are upgraded to a color copy of the book. What are Challenges for you in Following-Through?